President Vladimir Putin and U.S. President George W. Bush agreed Saturday to work together to combat nuclear terrorism, saying the greatest threat facing the world today is the threat of attack by nuclear, chemical or biological weapons. The accord was to be announced at a joint news conference by the two leaders before the opening of a summit of world leaders. The anti-terrorism initiative builds on an existing "Proliferation Security Initiative," a U.S.-led group of dozens of nations that have pledged to help seize illicit weapons as they are transported around the world. 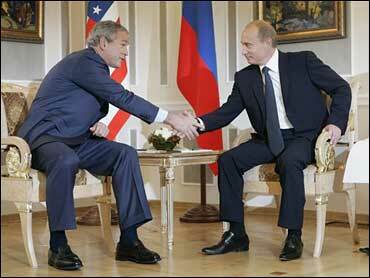 Putin and Bush greeted each other warmly at the open of their talks. "It is extremely important for us to synchronize our watch with you, Mr. President, and with your administration," Putin said. "Hopefully, it will serve as a boost to the G-8 summit." Putin told Bush, "We count on your support during this international event." The new program, known as the Global Initiative to Combat Nuclear Terrorism, envisions other countries joining forces with the United States and Russia to combat the threat, a U.S. official familiar with the program said. The program calls on states to improve accounting, control and physical protection of nuclear material and radioactive substances as well as the security of nuclear facilities, the official said. The official declined to be identified without authorization to talk about the program. The initiative was first reported by The New York Times. Putin and Bush met Saturday morning on the grounds of Konstantin Palace, site of this year's Group of Eight economic summit. Upon entering a building set up for meetings, both leaders shook hands for photographers and sat down. At Saturday's session of the G-8, "we will have a chance to discuss both bilateral issues and issues of the global agenda," Putin said in comments translated into English for Bush by an aide. Bush did not have any opening remarks. Bush said before an informal dinner with Putin Friday night that he still enjoys a "solid friendship" with the Russian leader - despite differences over Israel, Iraq, trade and human rights. The U.S. and Russian presidents will be joined by the leaders of Britain, Canada, France, Germany, Italy and Japan at the annual G-8 summit, which begins with dinner Saturday night and continues through Monday. This is Russia's first year as host. The recent violence between Israel and Hezbollah militants in Lebanon is a late but unavoidable addition to the agenda. Bush refused Friday to pressure Israel for a cease-fire. He called on the leaders of Egypt and Jordan to explore ways to end three days of furious fighting. But the White House signaled skepticism about a cease-fire plea from Lebanese Prime Minister Fuad Saniora. "The president is not going to make military decisions for Israel," said White House press secretary Tony Snow, saying it was unlikely that Israel or Hezbollah would agree to a cease-fire now. That put Bush at odds with Putin and several other G-8 members who have criticized Israel's attacks and called for a cease-fire. Putin called Friday on all sides in the Middle East fighting to end the bloodshed immediately. Dmitry Peskov, a senior Kremlin spokesman, said U.S. and Russian "disagreements are not so great when it comes to strategy ... because both Russia and the United States call for an end to these bombardments and an end to these terrorist attacks whichever side of the conflict they are coming from." Bush and Putin also have some issues apart from those pressing on the full G-8 membership. Both countries appear close to announcing an accord in which the U.S. would bestow its long-sought blessing on Russian admission into the World Trade Organization, the 149-nation group that sets the ground rules for global trade and investment. On Friday, Bush met with a group of 17 Russian activists troubled by Putin's steps away from individual rights and democracy. Bush said he shared their concerns, and promised to deliver some of their specific grievances to Putin when they met. At the same time, Bush said, he considered Putin a friend and it was important for the United States to "stay engaged with Russia."